Loving mother and dear friend, Mary Waldvogel, passed away peacefully on January 26, 2019 in Barrie, Ontario, surrounded by family and supported by a nursing team at the Barrie Manor Enhanced Care Community. Mary was born December 21, 1928 in Montreal to parents Catherine and F. M. Van Wagner. Summers spent with siblings Charles, Peter and twin sister Rachel at Camp Nominingue (founded by their father), instilled a love of nature, outdoor living and a lifelong passion for walking barefoot on the earth. Winters brought weekend train trips with family and friends to cross-country ski in the Laurentians. 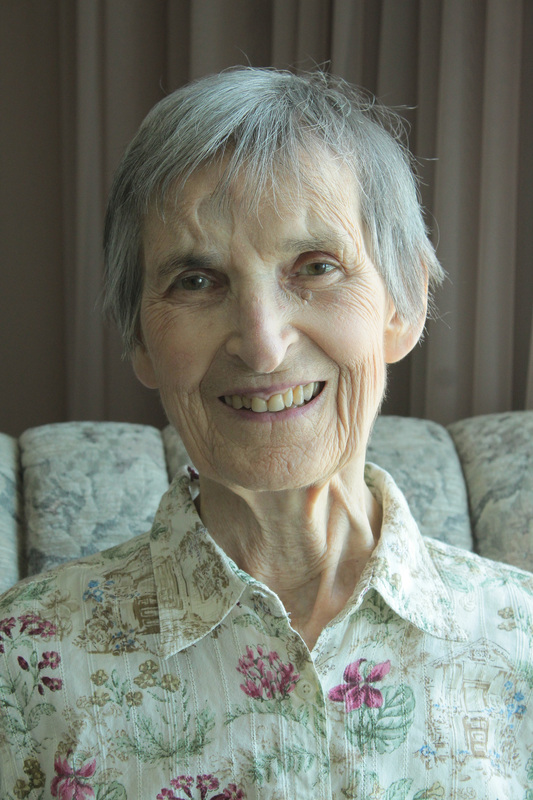 Mary studied Physiotherapy at McGill, graduating in 1950, where she was President of the Physiotherapy Society, member of the Outing Club and was awarded the Lieutenant-Governor's Silver Medal for graduating first in her class. Mary married her devoted husband Hans in 1956 and raised a family in St. Bruno, Quebec before moving to Oakville, Ontario. In 1987, Mary and Hans retired to Sugarbush, near Barrie, Ontario where they enjoyed a new community, gardening and the peace of the Huronia woods. A few years after Hans’ passing, Mary made her home in Barrie overlooking Lake Simcoe. Mary was ahead of her time, becoming vegan in the 1970s, and teaching those she knew how important nutrition is to maintaining health. Mary touched many people with her loyal friendship and the sharing of delicious soup. Over the years, she only grew in her delight in life and love of laughter. In her lifelong search for meaning, Mary was an active congregant at Unity Church in Montreal and United Church of Canada in St. Bruno, ultimately practicing meditation, seeking inner peace and helping others do the same as a loving and devoted volunteer with the Sawan Kirpal Ruhani Mission / Sant Mat spiritual path. Mary was preceded in death by her loving husband Hans and dear sister Rachel Hendershott. Mary is survived by her children Peter (Irene), Mark (Terry), Anna (Niall), grandchildren (Christine, David, Eric and Claire) and her brothers. Mary will be deeply missed by many. Mary’s family offer special thanks to her friends (“Team Mary”) supporting her in her last weeks: Diana, Diane, Kandace, Laura R., Marybeth, Sophie and Teresa. Thanks also to Senior Helpers management; staff at the Specialized Seniors Care and Transitional Units at Royal Victoria Hospital; the caring nursing and PSW staff at Barrie Manor; the Palliative Network (NSMHPCN) including volunteer Laura J.; and Mary’s palliative doctor, Dr. J. Lai. Donations to Kids Help Phone Canada in Mary’s name are welcome. Her children would like friends and family to consider offering gifts of time to the elderly in her memory. A celebration of Mary's life is scheduled for Saturday April 27, Parkview Community Centre, 189 Blake St, Barrie, ON. Ceremony 2-3pm, with an informal reception and light refreshments to follow. All welcome. Mary's family requests guests wear something colourful to honour Mary's love of colour. We send our deep condolences to you all. We pray that you find peace and comfort with loving memories. Our heartfelt condolence. May her soul rest in peace. Our deepest condolences to family and friends of Mary Waldvogel. We pray for her departed soul to rest in peace at the divine feet of Masters. Our heartfelt condolences go out to you and your family. All will surely miss the presence of a truly lovable and kind person. Please accept our heart felt condolences. May her soul rest in peace? Extending comfort and peace to all Mary’s family and friends. Rest assured that the loving kindness and joy that Mary extended to others, was a true reflection of a joyous soul. My daughter and I are so blessed to have known her, witness her positivity and feel her glow. Mary. You were an amazing woman. You were much loved by all and will be missed. We are sorry to hear about the passing away of Mary. May the all mighty God keep her soul in peace and give the strength and peace to the family. Mary was a dear friend and support at a time in my life when I felt I had none. Her kindness to my daughter and I will always be remembered with love. My condolences to you all. My heart felt condolences to the family. She was an amazing woman. I missed Mary when she moved from Sugarbush as she live just down the street (hill!!). So sorry I can’t come on the 27th as I have entered a fund raising athletic event for the OSMH that day. I would have worn something pink!! as I remember when she changed the colour scheme in their house to incorporate a lot of pink following Hans’ death. She loved pink!.